Elder Craig Heath said during an early morning international prayer call that the service will begin at 11 a.m. and would celebrate Long’s life, sacrifice and service, according to the Atlanta Journal-Constitution. The announcement of the death of the controversial preacher from an “aggressive cancer” at New Birth on Sunday had hit congregants like a seismic jolt that sent them to the ground and triggered open wailing. 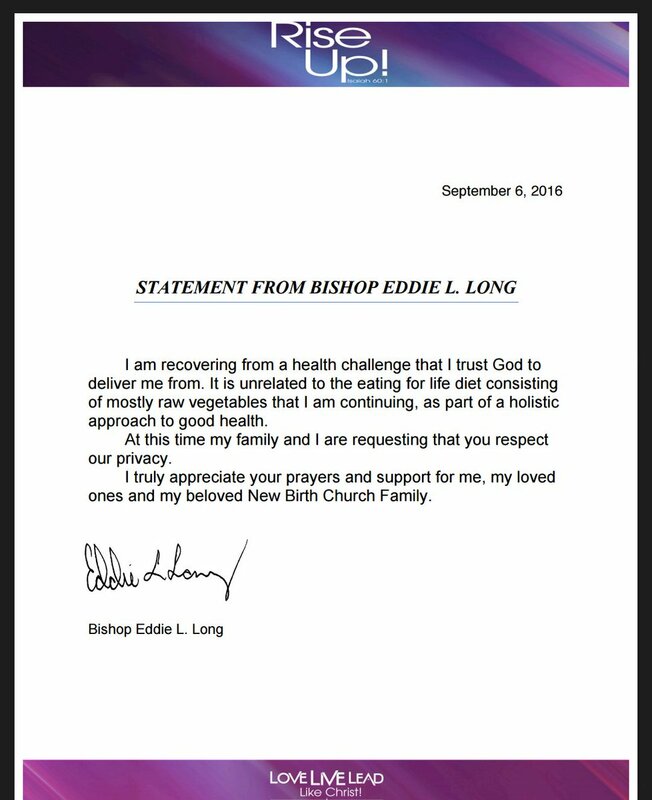 Bishop Eddie L. Long was 63 years old. He is survived by his beautiful wife, First Lady Elder Vanessa Long, 4 children Eric, Edward, Jared and Taylor and 3 grandchildren. The Long family thanks you for your prayers, condolences and messages of love.